Our food choices matter beyond our health and have a lasting impact on the world at large. The 2015 Dietary Guidelines Scientific Committee Report noted, “Consistent evidence indicates that, in general, a dietary pattern that is higher in plant-based foods ... is more health promoting and is associated with lesser environmental impact ([greenhouse gas] emissions and energy, land, and water use) than is the current average US diet.” Sustainable diets can improve the health of people and our environment. In this webinar, Danielle Nierenberg, founder of Food Tank, the fastest growing nonprofit in the food movement, will walk participants through the basics of sustainable food and discuss legislation and policy on sustainability in the United States. To help you connect with patients on sustainability, Chris Vogliano, MS, RDN, will provide evidence-supported recommendations and clear communication strategies for RDs and DTRs to integrate into their practices. Patients and clients are seeking specific, actionable recommendations on sustainable nutrition, and this webinar will help you meet that demand. Identify and understand basic principles of sustainable food. Understand sustainable food initiatives and related legislation and policy in the US. Recognize the positive relationship between nutrition and sustainability. Incorporate the sustainability and nutrition connection into nutrition counseling and practice. Provide patients and clients with tools and resources to help them integrate more sustainable food and nutrition practices into their daily lives. Danielle Nierenberg co-founded Food Tank, a 501(c)(3) non-profit organization, in 2013 as an organization focused on building a global community for safe, healthy, nourished eaters. Prior to starting Food Tank, Danielle spent two years traveling to more than 60 countries across sub-Saharan Africa, Asia, and Latin America, meeting with farmers and farmers’ groups, scientists and researchers, policymakers and government leaders, students and academics, along with journalists, documenting what’s working to help alleviate hunger and poverty, while protecting the environment. Danielle has authored or contributed to several major reports and books and her knowledge of global agriculture issues has been cited widely in more than 8,000 major print and broadcast outlets worldwide. Danielle has an M.S. in Agriculture, Food, and Environment from the Tufts University Friedman School of Nutrition Science and Policy and spent two years volunteering for the Peace Corps in the Dominican Republic. Chris Vogliano is a Registered Dietitian Nutritionist with a passion for creating a healthy, sustainable, and waste-free food system. 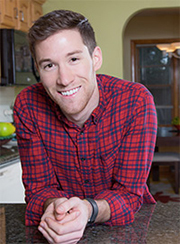 Chris has served as a research fellow for The Academy of Nutrition and Dietetics Foundation, was awarded the “Young Dietitian of the Year” award by the state of Washington, and was recognized as “Today’s Dietitian Magazine’s” 10 RD's who are making a difference. Chris has also recently taught a food systems course at The University of Washington and has presented at over 35 conferences around America. Most recently Chris is pursuing his PhD in Global Health in Wellington, New Zealand, focused on creating more biodiverse sustainable food systems. During his free time Chris loves doing anything outdoors — hiking, biking, yoga, and dining his way through new cuisines. Accreditation for this activity was obtained by Barilla America, Inc. The presenters report the following relevant disclosures: Chris has received research support from a Massey University Scholarship. Danielle has received research support from BCFN and is a consultant to Barilla. Both presenters have certified that no conflict of interest exists for this program. View our disclosure policy.